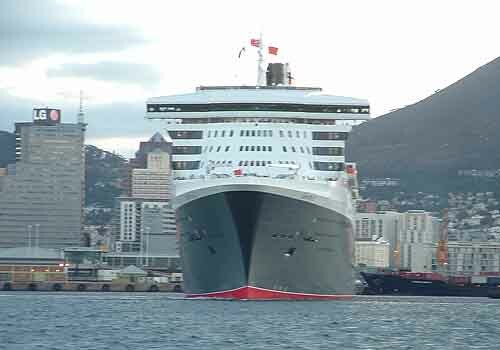 This morning the second largest passenger ship afloat in the world sailed into Table Bay on its maiden voyage to Cape Town. It's on a world cruise that started in New york and crossed the Atlantic to Southampton. From there it sailed through the Mediterranean and Suez Canal to Mumbai, India; Nagasaki, Japan; before making its way south to Australia. stopping off at Whitsunday Island before sailing to Auckland New Zealand. From there it sailed west to Sydney, Adelaide and Perth before heading for Mauritius and Durban. 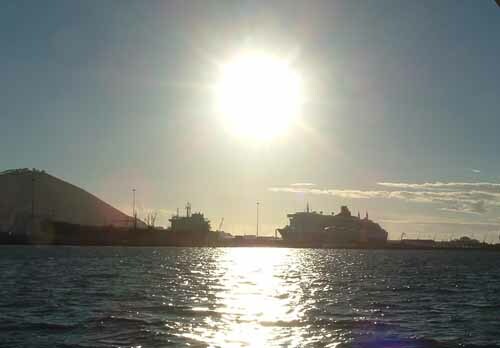 The ship docked in Cape Town today and will stay two nights before setting sail for St Helena Island, Rio de Janeiro and Miami before heading back across the Atlantic to Southampton. So what does it cost to sail on the world's largest ship afloat? Its not as bad as you would think if you were earning pounds sterling but as a South African it could become pretty pricey. 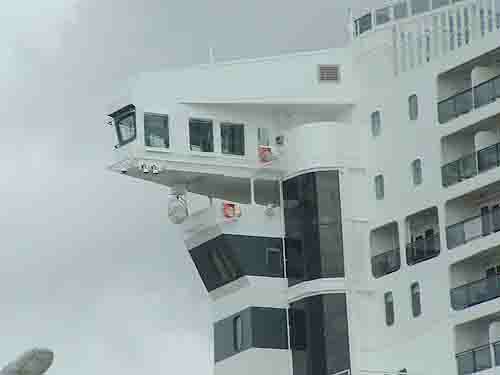 One would think that only the rich and famous would sail on the Queen Mary 2 and that they would get special treatment when waiting to board the ship. That was not the case in Cape Town today. 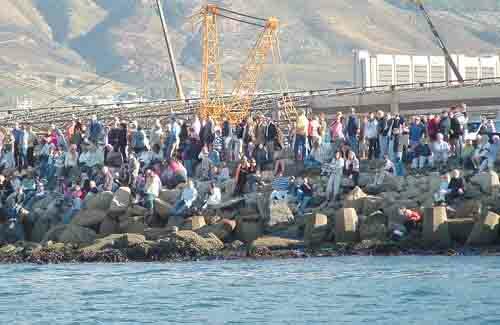 People boarding the ship in Cape Town were made to wait in long queues as they went through customs and security before being allowed aboard. One lady in the queue had been there since 11.30 am and when I got to the ship at around 14.30 pm was still a good two hundred metres from the customs and security tent. At last the end of the queue is in sight!! To sail on a ship like the Queen Mary one must have some money, but it comes to naught as you are all treated equally by the ship and customs till you are aboard. What makes the ship the second largest afloat? To start with it is 1132 feet long (347 metres) more than the length of three rugby fields set end to end. From keel to funnel she is 236 feet high ( 72 metres). 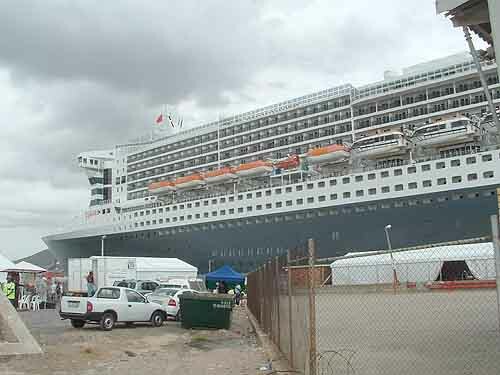 This ship is big as you will see from the accompanying photos. Standing 500 metres from the ship I could not get the entire ship into a shot. Here are some interesting statistics regarding the ship. 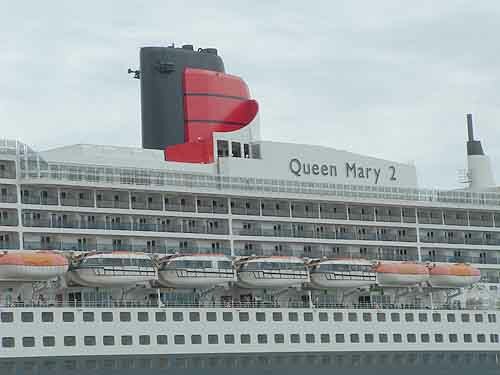 QM2 is more than twice as long as the Washington Monument is tall (550 ft.
Now you know why I could not get the full ship on one photo. 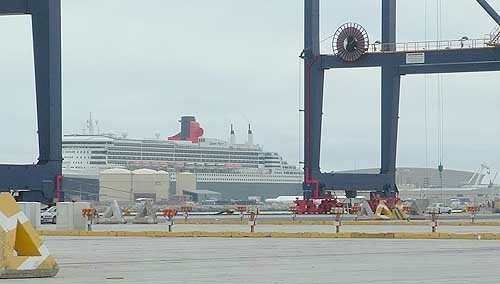 The visit of the Queen Mary 2 was too short. 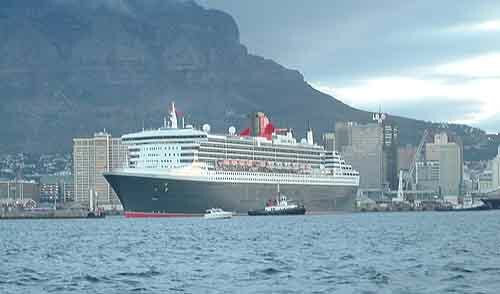 She spent only two days and one night in Cape Town's Duncan dock before she sailed away on Friday evening. The ship was treated like royalty while here. A lot better than the passengers who had to stand in long queues to board her, thankfully on a day when it was cooler than what we have been experiencing here of late. I was privileged to get an invite to go on a harbour cruise to see the ship leave port. 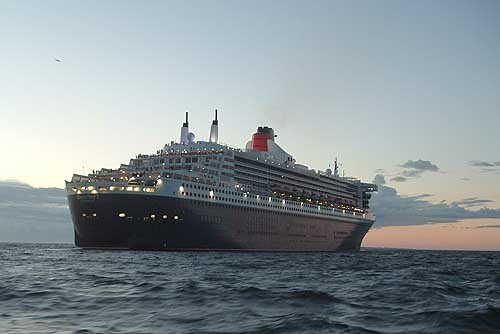 What an experience to be out on the water waving goodbye to such a magnificent ship. As is usual in the holiday travel industry there is always some one who is late getting back from a trip or tour and causing those who took the trouble to be on time to wait for them to arrive. 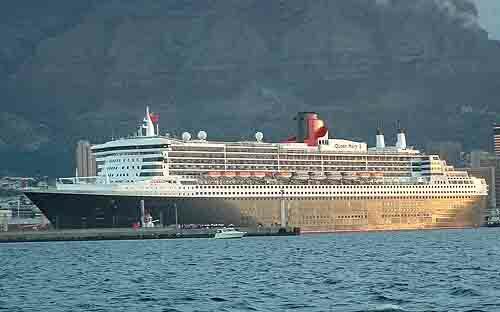 In this instance 3000+ people on the Queen Mary 2, two tugs and the pilot boat, an assorted array of boats in the bay and a number of helicopters, plus the thousands of people who had lined up outside the Port authority's building and on jetties around the harbour to bid the ship farewell. 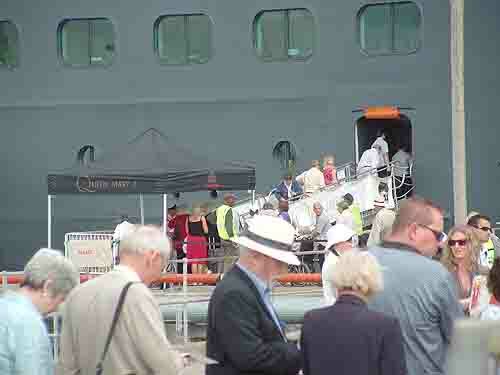 Everyone had to wait for an hour longer than was necessary due to two people being late back from a tour, and once they had arrived for the great ship to slip her moorings and leave the harbour. 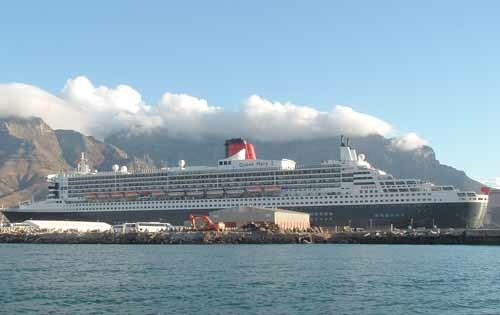 After the tugs had moved her away from her berth they had to turn her stern towards Table Mountain and then move the whole ship northwards before she was able to set sail. 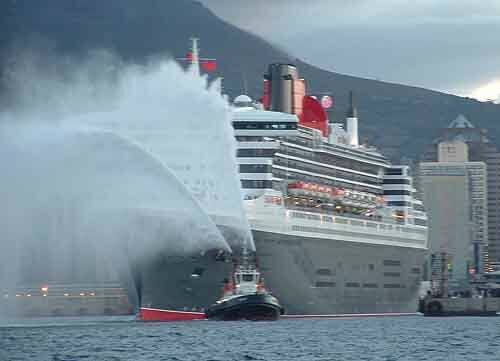 Her final sendoff after dropping the lines from the tugs and the pilot was one of the tugs sending a magnificent spray of water into the air to say farewell. 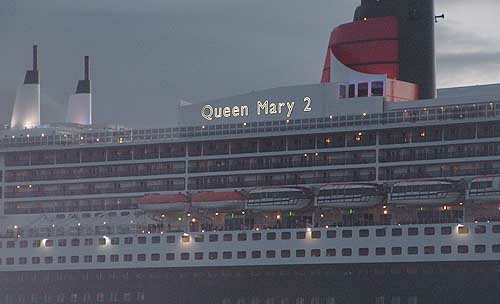 The Queen Mary 2 answered by blowing her horn, causing a large cheer from the crowds and the waiting boats in the bay to go up. 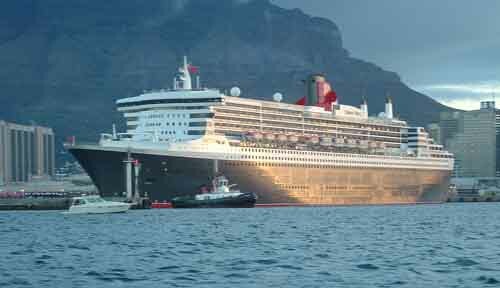 With the sun setting over Table Bay the magnificent Queen Mary 2 made her way slowly out into the bay to continue her world cruise with her next destination being the islands of St Helena. What a fitting departure for a queen. 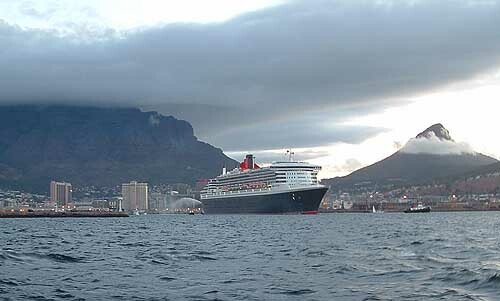 Cape Town is a magnificent destination that even brings royalty to stay here and enjoy our hospitality. Its time for you to come as well.